TABLE OF CONTENTS SUBMISSION CHECKLIST ………………………………………………… 3 SECTIONS 1. Submission Checklist 1. Technical Proposal (in 2 copies) I.
XIV. Format of Curriculum Vitae XV. XVI. Experience of Consortium XVII. Additional Information Note : Processing Charges (DD of Rs. 25,000/- in favour of Director, PPP Cell, payable at any Nationalized/Scheduled Bank in Goa shall be submitted alongwith Bid Document.) II. Financial Proposal (in one copy) I. As per Terms of Reference. This covers TEFS including Structural, Environmental, Financial Studies, Preparation of Bids, assistance in Bidding process and selection of Bidder culminating in signing of concession Agreement, etc. 25th November, 2009 upto 15.00 hrs. Cost of Bid Document of Rs. 10,000/- and Document processing fee of Rs. 25,000/will be non refundable and in the form of Demand Draft drawn on any Nationalized/ Scheduled Bank in favour of Director, PPP Cell payable at Panaji, Goa. Performance Security (Ref. Professional Liability Insurance equal to Para 16 in Instructions to cost of consultancy fee valid for the entire Bidders) contract period. Time limit for consultancy as per – Time Schedule given in Cl. 7 under Terms of Reference. Preamble Public Private Partnership Cell (PPP Cell) has been appointed by the Government of Goa as the nodal agency for implementing the Vasco – Panaji Sea Link Project from Vasco to Panaji. PPP Cell now intend to appoint well experienced and competent Consultants/consortium of Consultants of international repute for providing techo-economic, environmental, finance and legal consultancy services in implementing the Vasco – Panaji Sea Link Project from Vasco to Panaji. Broad structure of offer Sealed offers under two envelope system in the prescribed forms are invited by PPP Cell, from prospective Consultants for providing the consultancy services listed under the Scope of Services in the bid document. Interested Consultants are hereby invited to submit bid as per the Instruction given hereafter. The scrutiny of bid submitted and, if required, the discussions/negotiations may ultimately lead to a contract with one of the bidders. Bid Structure The standard terms and conditions of the contract for providing consultancy services are contained in this document. The bidders are requested to go through (i) Instruction to Bidders, (ii) Terms of Reference, (iii) Conditions of the Contract (iv) Special Conditions of the Contract and (v) the list of Various Enclosures to be submitted by them along with the complete bid document. The bidders should fully inform themselves of all the terms and conditions, scope of work and the local conditions of this project. All the bidders shall be deemed to have read and understood the various terms and conditions provided in this bid document before submitting their proposals for the services. The formats for submission are enclosed in this document to help the bidders in submission of bids. Time schedule The essence to the contract shall be adherence to the time schedule for performing the services of required quality. Language of Bids All information in the bid shall be in English. Information in any other language shall be accompanied by its translation in English. Failure to comply with this may disqualify a bid. In the event of any discrepancy in meaning, the English language shall prevail. furnished with the bid. All the pages of this Offer Document must be initiated/signed and submitted to PPP Cell within the stipulated date of submission of offers. 7. Local Conditions and Preliminary Costs (a) Each bidder should fully inform himself of all local conditions and factors, which may have any effect on the execution of services covered under these documents. It must be understood and agreed that all the factors have properly been investigated and considered by the bidders before submitting the bid. PPP Cell will not entertain any claim or financial adjustment or modifications in time schedule which arise due to inadequate appreciation by the bidder at the time of submission of bid. (b) All costs of preparing the proposals, presentations including site visits etc. shall be borne by the bidders. Price Bids The bidders are required to quote a bid price (fee) in Indian Rupees inclusive of all taxes and levies except the statutory service tax for the consultancy services in the prescribed format given in Appendix with the required break-up. The statutory service tax as applicable shall be reimbursed separately, on actual basis. Duties and Taxes No claim on any duties, taxes (except service tax which is payable with the bill of bidder) and other levies payable with the bill of bidders in respect of transaction between the bidders and consortium members, subConsultants or others will be entertained by PPP Cell. Validity The offer shall remain valid for a period of one hundred and eighty (180) days from the stipulated last date for receipt of proposals. The offer including personnel proposed for the assignment as well as quoted fees shall remain unchanged during period of validity. Submission of Bids (a) Proposals should be submitted in two separate envelopes namely, ‘Technical Bid’ and ‘Financial Bid’. The technical bid shall be submitted in two copies while financial bid shall be in one copy. All the copies of the bids shall be placed in a single envelope. The technical and financial bids duly sealed in separate envelopes must be kept inside the single envelope and clearly superscribed as “Consultancy Services for the implementation of Vasco – Panaji Sea Link Project from Vasco to Panaji – ‘Technical Bid’ (Envelope – I) and ‘Financial Bid’ (Envelope – II) for proper identification. Consortium Partners 1. 2. 3. Sub-Consultants 1. 2. 3. Bids are liable to be rejected if the said agreement between consortium partners and sub-Consultants, as indicated above, is not enclosed. It may be noted that expatriate members of the consortium/sub-Consultants will be required to take necessary permission from Reserve Bank of India (RBI)/FIPB, whichever is applicable, for carrying out their business in India. During the consultancy period, under exceptional circumstances, change of member of the Consortium may be allowed with prior approval of PPP Cell, subject to replacement of the member by equally competent Consortium/J.V. partners to the satisfaction of PPP Cell. 12. Eligibility Criteria For the purpose of this consultancy assignment, the bidder shall meet the following qualification criteria. The technical and financial bids of only those bidders, who meet the said minimum qualification criteria, will be considered. The Engineering Consultant who will act as the Lead member of Consortium should have: a) Minimum 10 years of experience in consultancy services. b) Experience of providing pre-tender and supervision services for at least one bridge project (road or rail) over sea or river or creek costing not less than US$ 100 million at current prices, anywhere in the world in the last ten years (weightage of 8% per annum will be allowed to bring cost to current level in case the project is completed earlier). In addition: i) The consortium member/identified sub-Consultant should have experience in providing legal services on project concession agreements/signing of contracts in one BOT infrastructure/project of a minimum value of USD 40 millions. ii) The consortium member/identified sub-Consultant should have successfully rendered financial advisory services in a BOT infrastructure project of a minimum value of USD 40 millions. “Success” would mean resulting in financial closure. The minimum qualifying score in each category above would be 60% and overall minimum qualifying score in aggregate shall be 75%. Successful bidders will be notified before opening financial bids. 14. Financial Bids Only those bidders who secure 75% marks or above in the technical bid shall qualify for opening of financial bid. The bidder will quote a bid price for services together for conducting the assignment and will include inter alia, the fee for all components identified in the Terms of Reference. The total quoted fee will not be increased due to time and cost overrun. The Price bid is to be provided in the formats shown in Appendix 2. Significant lack of clarity on any cost of item as called for above could lead to the bid being rejected, if it hinders a uniform evaluation process, even if the bid meets all other criteria. (c) Proposal with lowest score will be given financial score of 100 & other proposals will be given financial scores that are inversely proportional to their prices. (d) On the basis of combined weightage score for quality and cost, the Consultant shall be ranked in terms of total score obtained. The proposal obtaining the highest total combined score is evaluation of quality and cost will be ranked as H1, who shall be invited for negotiations, if required. (e) Upon evaluation of offers, the notification on Award of contract to the bidder will be intimated to the successful bidder by PPP Cell. (f) The selection of the Consultant will be at the sole discretion of PPP Cell who reserves rights to accept or reject any or all the bids without assigning any reasons. PPP Cell reserves the right to call for additional information from the bidders. 16. Professional Liability Insurance The Consultant shall take Professional Liability Insurance policy with minimum coverage value equal to the cost of consultancy fee and shall be valid for the entire period of consultancy contract. Employers’ Workers Compensation Insurance The Consultants shall take the Employers’ Workers Compensation Insurance policy in respect of the personnel of the Consultants and any of the sub-Consultants in accordance with relevant provisions of the applicable law. Schedule of tendering program is as per the contract data. Processing Charges The bidder is required to pay a non-refundable processing charges amounting to Rs. 25,000/- in the form of Demand Draft drawn on any Nationalized/Scheduled Bank in favour of Director, PPP Cell, payable in Goa while submitting the bid document. Bids received after the deadline of submission will either not be accepted and, if inadvertently accepted, shall not be opened and shall be returned unopened to the bidder. The successful bidder who will function as Consultant for assisting PPP Cell in evaluation and selection of BOT operator will not be eligible for participating themselves or with other sub-Consultants in bidding for implementation with BOT operator. This shall also apply to group or associate firms of the successful bidder where the same owner has majority share. The Vasco – Panaji Sea Link Project is proposed to be developed in suitable phases. Construction of a sea link from Vasco to Panaji is envisaged in this project and is termed as “Vasco – Panaji Sea Link Project”. the possible structure of this study as envisaged presently are as follows: Alternative I - Panaji – Dona Paula – Mormugao Harbour involving 14 kms. length, of which proper sea link may be 5 kms. Alternative II - Panaji – Bambolim – Vasco Harbour about 17 kms. length, of which proper sea link may be 6 kms. The Consultants will have to study the above possible alternative or any further modified combinations based on requirements and feasibility. The combinations may be suitably phased for implementation based on feasibility & traffic requirements. 2. Project Structure PPP Cell proposes to develop this project on a Build Operate Transfer (BOT) basis with viability gap funding. If necessary, BOT Bids will be invited through an international competitive bidding process to select the entrepreneur (BOT operator). The (private sector) entrepreneur will be required to develop the project through design, construction, funding, operation and maintenance of the facility. The entrepreneur will be entitled to toll collection and will be responsible for operation and maintenance during the concession period. The entrepreneur will also be responsible for managing specific risks in the project such as design, construction, funding, traffic, operations and maintenance as well as projected and actual receipts from collection of toll till the structure is finally handed over back to PPP Cell, after expiry of concession period. Need for Consultant Since the project is of complex nature, PPP Cell is proposing to appoint a reputed Firm/Consortium as the Consultant who will assist PPP Cell in ascertaining the detailed technical feasibility, financial viability, getting Environmental Clearance, wherever necessary, framing up the scope for BOT, pre-qualification of the entrepreneurs, preparation of the Request for Proposal (RFP), assistance in bidding process, evaluation and selection of entrepreneurs, assisting in negotiations and finalization of the concession agreement. Study Components (i) Vasco – Panaji Sea Link The Consultant shall ascertain the Techno-economic & social feasibility & Environmental Impact Assessment of the project or any other suitable option evolved by the Consultant and considered for detailed examination by PPP Cell. The Consultant shall then work out broad concept design and work out its feasibility as a part of the project. If it is found feasible and socially acceptable the same shall also be included in the BOT bid document for implementation. (ii) Dispersal System Proper and quick dispersal of traffic from each of the connector/land fall point and port connectivity are the key issues to the success of this BOT Project. Accordingly, the Consultant shall study and desing an adequate dispersal system at each of the connector location. Also the parking requirement is likely to be an important issue. The Consultant shall study this requirement and design adequate parking lots at suitable and feasible locations near each connector landfall points. Proper inter connectivity to project and feeder services (such as buses, AC coaches and all Public Utility vehicles, etc.) in the area shall also be studied. The parking facilities are proposed to be also developed as a part of the project along with its dispersal system. After ascertaining/confirming the feasibility of alternatives the Consultant shall finalize the scope of the Project to be included in the RFP (bid document). Carry out Analysis a) Economic and Financial Analysis: After finalization of scope, the Consultant shall undertake the detailed economic & financial analysis and work out the economic internal rate of return (EIRR) considering the social cost benefit analysis and submit the Business Plan report in soft & hard copies as desired by PPP Cell . The Consultant shall carry out the preliminary engineering detailing to arrive at the cost of the project and shall submit the cost estimate report. b) Improving Project Bankability: Based on an analysis of the project feasibility, the Consultant shall identify and analyze various options for improving the project bankability. The Consultant shall assist PPP Cell in structuring the options identified so as to improve the project financials. Environmental studies, clearances and social impact assessment a) Environmental Clearance The environmental clearance to the project from Vasco to Panaji has to be obtained on the project, examined and recommended by the Consultant and approved by the PPP Cell. Consultant has to pursue the issue with various authorities and assist in all respects while obtaining the environmental clearances. All the required documents should be prepared and furnished by the Consultant at their own cost. PPP Cell shall help the Consultant in obtaining the environmental clearance from concerned organizations, if required, at any point of time during execution of project. b) Environmental Management Plan The Consultant shall review and work out the Environment Management Plan so as to fulfill the conditions stipulated in the environment clearance for the project and cover monitoring and mitigation plans. The Consultant shall ensure that RFP complies with environment management plan and other statutory requirements of MOEF, New Delhi. c) Disaster Management Plan The Consultant shall suggest Disaster Management Plan for the project including making suitable provisions for the same in the RFP. d) Assistance in obtaining approvals The Client shall help the Consultant in obtaining necessary approvals/ clearances/NOC, etc. from various statutory authorities such as Mormugoa Port Trust, Panaji Municipal Corporation, Town and Country Planning, City Survey Office, etc. for timely implementation of the project. Land Acquisition The Consultant will be required to identify the requirements of land and prepare land acquisition plans. The Consultant will be required to coordinate with various authorities for getting the relevant village maps/city survey maps, etc. and for superimposing the alignment plan on the same. The Consultant has to estimate the cost of the land acquisition and its sensitivity on the project cost. PPP Cell intends to provide the land required for the project i.e. Right of Way (ROW) to the entrepreneur. This task is critical for successful and timely commencement of the project. The Consultant shall also identify the land required for temporary works such as jetties, casting yard, fabrication yard, material and equipment storage, labour colonies, etc. and also prepare preliminary drawings. At the pre proposal stage, the (B.O.T.) bidders’ views will be sought on various aspects of project implementation. The Consultant will attend the meetings, pre-proposal conference to offer their advice and assistance to PPP Cell in providing necessary clarifications, etc. The views, comments and suggestions of (BOT) bidders as recorded in the pre-proposal conference shall be evaluated by the Consultants and put up with their recommendations to the PPP Cell duly considering technical, financial and legal aspects. Based on this review and the results of conference, the Consultant will prepare a report with recommended changes to the Bid document in the project implementation/financing structure. Evaluation of proposals received and assistance in selection of Entrepreneur. Consultants shall assist PPP Cell in the evaluating bids (for BOT) in accordance with the criteria laid down in the bid document and recommend the preferred (B.O.T. bidder) Entrepreneur. The Consultant shall evaluate technical proposal of BOT and financial bids and submit evaluation report covering the eligibility, responsiveness to the (PPP Cell) bid conditions, and make recommendations. Assistance in negotiations and finalization of the concession agreement The Consultant shall assist PPP Cell in the negotiations with the preferred (BOT) bidder on the concession agreement and authorized of the same consistent with the agreed scope of services and performance criteria, etc. The Consultant will also prepare financial viability report including viability gap funding, and assist PPP Cell in getting viability gap funds from Government of India based on the final negotiated agreement with the Entrepreneur. The Consultant shall identify and draft the amendments required to the prevailing government acts/rules for viability and successful implementation of the project. The Consultants shall also identify and pursue in obtaining the necessary statutory approvals required from the various government bodies. viii) Any other Report necessary for the project. ix) EIA for proposal etc. not covered in the earlier MOEF clearance. x) Audio video presentations for various forums from time to time. xi) Brochures, handouts, displays. xii) The Consultant shall prepare a 3D physical model of the project. This model shall illustrate the total Project from Vasco to Panaji, all connectors, traffic dispersal facilities, the existing roads, etc. on a proper scale and material with proper illumination to the satisfaction of PPP Cell. The model shall be ready before the issue of bid documents to bidders/developers/contractors for the project. All the above documents shall be submitted in hard and soft copies. Reports shall be submitted in 50 Nos. of copies and others such as brochures, handouts, etc. shall be in sufficient nos. for BOT bidding process (approx. 1000 each). 5. Traffic and Transportation Engineering. Quantity survey. Geo-technical Engineering. Tunneling. Architecture and Urban Planning. Environmental and social impact studies. Electrical and instrumentation system. Bridge Engineering/Structural Design. Transport Economics and Financial Analysis. Instrumentation, Traffic Surveillance, Communication, Control. Quality Assurance. Legal Expertise. Highway Engineer. Financial Expert. Bid Document Expert. PPP and Structuring Expert. Project Finance and Financial Modeling Expert. Any other services needed in area of expertise for successful implementation of the project. S. No. 1. 2. 3. 4. 5. 6. 7. 8. 9. 10. 11. 12. 13. 14. The Team Leader shall have international experience of Bridge Projects of similar magnitude and nature in responsible position of at least 12 years and the Team Leader shall be from lead Consultant firm itself and available during all important discussions and meetings. The Dy. Team Leader will be stationed at Goa along with his project team. The bidder shall arrange their own office space and bear its’ expenditure. 6. In case it is decided to follow a procedure based on post qualification of bidders, the stages 4 and 5 would be combined. Penalty due to delay in completion of milestones : The Client has reserved the rights to reduce the remuneration by 2% of offer fee per month, if the Client discovers the delay is mainly at the Consultant end. This penalty is limited to maximum of 12% of offer fee. Monitoring In order to guide and monitor the project a Technical Advisory Committee has been constituted. This committee will review the progress of the project and various reports submitted by the Consultant. Their recommendations, suggestions and directives should be given due weightage on all aspects of the projects. The Consultant shall participate in the deliberations of the said meetings and prepare minutes of the meeting. as per agreement. Suitable extension will be granted to the Consultant by client’s designated Officer as mentioned in Contract Data. The services of Consultant, in valid extension, will be normal services without any extra charge as compensation from Client and will be paid at contract rate without any escalation charges. 11. Responsibility for accuracy The Consultant shall be fully responsible for correctness and accuracy of all activities specified in this TOR. GENERAL CONDITIONS OF CONTRACT 1. General Conditions of contract comprise the general conditions incorporated in the “Client / Consultant Model Services Agreement” printed in the Third Edition 1998 published by the Federation International Des Ingenieurs – Conseils (FIDIC), Lausanne, Switzerland. 2. It is intended that Bidders shall purchase directly their own individual copies of the agreement as specified herein above to be acquainted with the conditions governing the rights and obligations of the parties. Client means the ‘Public Private Partnership Cell (PPP Cell) acting through the Director’. Month and Year and all dates shall be as per the Gregorian calendar. The time referred to shall be Indian Standard Time. 1(xii) The ‘Site’ shall mean the lands and/or other places, on under, in or through which the work is to be executed under the contract including any other lands or places which may be allotted by the Client or used for the purpose of contract. 1(xiii) ‘Urgent Works’ shall mean any measures, which in the opinion of Engineer becomes necessary during the progress of the work to obviate any risk or accident or failure or which becomes necessary for security of the work or the persons working thereon. 1(xiv) ‘Lead Firm’ shall mean the firm acting as lead firm representing the joint venture duly supported by Power of Attorney. 1(xv) The ‘Engineer’ means the Executive Engineer or any person appointed/nominated by the PPP Cell , to perform the duties and the responsibilities in administering this contract. 3. Scope of Services The Consultant shall perform Services relating to the Project. The Scope of the Services is stated in Terms of Reference. Additional services are those which are not covered in the accepted Agreement and will be performed on written Agreement as per agreed terms by Parties. Where the Services include the exercise of powers or performance of duties authorized or required by the terms of a contract between the Clients and any third party, the Consultancy shall act in accordance with the contract provided that the details of such powers and duties are acceptable to him where they are not described “anywhere in Contract”. Equipment and Facilities This clause is deleted. Client’s personnel This clause is deleted. Services of others. The Client shall at his cost arrange for the provision of services from others as required and the Consultant shall co-operate with the suppliers of such services. Supply of Personnel This clause is substituted as below. The personnel who are sent by the Consultant to work in the country of the project shall have been physically examined and found fit for their assignments, and their qualifications shall be acceptable to the Client. Changes in personnel This Clause is replaced and substituted as under. Absence of Key Personnel If Team Leader of any other key personnel is not available for services on site as agreed in Man Month Schedule then the admissible Man Month Payment shall be proportionately reduced for the period of absence. Liability and Insurance Liability of the Client 16.2 – This Clause is deleted. Compensation 16.3 – This Clause is modified a below. If it is considered that the Consultant is liable to the Client, compensation shall be payable only on the following terms: (i) Such compensation shall be limited to the amount of reasonably foreseeable loss and damage suffered as a result of such breach, but not otherwise. (ii) In any event, the amount of such compensation will be limited to the amount specified in Clause 18. (iii)If Consultant is considered to be liable jointly with third party, the proportion of compensation payable by him shall be limited to that proportion of liability which is attributable to his breach. Duration of Liability The Clause is deleted and substituted with following: The Consultant shall be considered liable for any loss or damage resulting from any occurrence if a claim is formally made on him before the expiry of the period which will be reckoned from the date of work order to the completion of defect liability period or the claims/court cases are settled, whichever is later. b) The proceeds the Consultants may be entitled to receive from any insurance maintained by the Consultants to cover such a liability, whichever of (a) or (b) is higher. B) This limitation of liability shall not affect the Consultant’s liability, if any, for damage to third parties caused by the Consultants or any person or firm acting on behalf of the Consultants in carrying out the services 19. Insurance for liability and indemnity The following amendments are made in sub-clause (v) with some additional sub-clauses as under: a) The cost of such insurance or increase in insurance shall be at the expenses of the Consultant for all sub-clauses under this Cl. 19. Client’s liability and worker’s compensation insurance in respect of the personnel of Consultant and of sub-Consultant, in accordance with the relevant provisions of applicable law, as well as, with respect to such personnel, any such life, health, accident, travel or other insurance as may be appropriate and b) Insurance against loss of or damage to (i) equipment purchased in whole or in part with funds provided under this contract, (ii) the Consultant’s property used in the performance of the services, and (iii) any documents prepared by the Consultants in the performance of the services. c) The Consultant shall take out and maintain and shall cause any SubConsultants to take out and maintain at their own cost on terms and conditions approved by Client insurance against the risks and for coverage as shall be specified hereunder and at the Client’s request shall provide evidence to the Client showing that such insurances have been taken out and maintained and the premiums therefore have been paid. d) Professional liability insurance, with a minimum coverage equal to the cost of the Consultancy contract. Insurance of Client’s property This Clause is amended as under: Unless otherwise requested by the Client in writing the Consultant shall make all reasonable efforts to insure on terms acceptable to the Client: (i) Against loss or damage to the property of the Client supplied or paid for under Clause 6. (ii) Against liabilities arising out of the use of such property. The services of Consultant shall be available till the completion of defect liability period or the claims/court cases are settled, whichever is later. The Consultant will maintain the record of work till completion of the defect liability period and/or till the claims and court matters pertaining to the work are settled, whichever is later. By Notice of the Client The Client may suspend all or part of the services by appropriate notice to the Consultant, who shall immediately make arrangements to stop the services and minimize the expenditure. If the Client considers that the Consultant is without good reason not discharging its obligations satisfactorily, he can inform the Consultant by notice stating the grounds for the notice. If a satisfactory reply is not received within 21 days, the Client may, by further notice suspend or terminate the agreement pursuant to Clause 27.1.3 and 27.1.4 below. Suspension The Client may, by written notice to the Consultant, suspend all or part of the services and payments to the Consultants hereunder, if the Consultants fail to perform any or their obligations under this Contract, provided that such notice of suspension (i) shall specify the nature of the failure and (ii) shall request the Consultants to remedy such failure within the period not exceeding thirty (30) days after receipt by the Consultants of such notice of suspension. By Notice of the Consultants Termination The Consultants may, by not less than thirty (30) days, written notice to Client, such notice to be given after the occurrence of any of the events specified in paragraph (a) to (d) below, terminate this contract: (a) If the client fails to pay any money due to the Consultants pursuant to this Contract and not subject to dispute to Clause 43 and 44 hereof within forty five (45) days after receiving written notice from the Consultants that such payment is overdue; (b) If the Client is in material breach of its obligation pursuant to this contract and has not amended the same within forty five (45) days (or such longer period as the Consultants may have subsequently agreed to in writing) following the receipt by the Client of the Consultant’s notice specifying such breach; (c) If, as result of Force Majeure, the Consultants are unable to perform a material portion of the Services for a period of not less than sixty (60) days; or (d) If the Client fails to comply with any final decision reached as a result of arbitration pursuant to Clause 44 hereof. Cessation of Services Upon termination of this Contract by notice of either Party to the other pursuant to Clauses 27.1.4 or 27.2 hereof, the Consultants shall immediately upon dispatch or receipt of such notice, take all necessary steps to bring the Services to a close in a prompt and orderly manner and shall make every reasonable effort to keep expenditures for this purpose to a minimum. With respect to documents prepared by the Consultants and equipment and materials furnished by the Client, the Consultants shall proceed as provided, respectively, by Clause 39. Foreclosure of Contract Agreement Client has reserved the rights for foreclosure of the Contract Agreement at any time during the consultancy period after awarding the work. Claims of any of the Consultant, due to this foreclosure shall not be considered and straightaway rejected. Payment upon Termination Upon termination of this Contract pursuant to Clause 27 hereof, the Client shall make the following payments to the Consultants (after offsetting against these payments any amount that may be due from the Consultants to the Client): 1) Remuneration pursuant to Clause 30 hereof for services satisfactorily performed prior to the effective date of termination; 2) Reimbursable expenditures pursuant to Clause 30 hereof for expenditure actually incurred prior to the effective date of termination; and 3) Except in the case of termination pursuant to paragraph (a) and (d) of Clause 27.1.4 hereof, reimbursement of any reasonable cost incident to the prompt and orderly termination of the Contract including the cost of the return travel of the Consultant’s personnel and their eligible dependents. Exceptional Services The following is the addition to the clause. The payment for exceptional services shall be as per the mutually agreed terms between Client and Consultant. Time for Payment (i) Consultant shall be paid in Indian Currency within 30 days after the receipt of invoice by the Client with supporting documents and approved by the Engineer. (ii) Agreed compensation for overdue payment with 8% per annum simple interest. Currency of Payment Currency applicable to this Agreement is in Indian Rupees. Third Party Charges on the Consultant This clause is deleted. Languages and Law (i) Language(s) of the Agreement shall be in English. (ii) This Contract, its meaning and interpretation, and the relation between Parties shall be governed by the Applicable Law of India and Goa State. Changes in Legislation Principal place of business is in the State of Goa, India. Copyright Clause replaced and substituted by (i) All documents such as plans, drawings, specifications, designs, reports and other documents prepared by the Consultants in performing the Services shall become and remain the property of the Clients, and the Consultants shall not later than 15 days upon termination or expiration of this Contract, deliver all such documents to the Client, together with detailed inventory thereof. The Consultants may retain a copy of such documents. The Client is free to use the above documents for other projects of the Client. Notices (i) Client’s address As prescribed in the Contract Data. (ii) Consultant’s address As prescribed in the Format III Appendix – I. Notices will be deemed to be effective as follows: (a) In the case of personal delivery or registered mail on deliver; (b) In case of facsimiles, 48 hours following confirmed transmission. The parties shall put in their best efforts to settle amicably all disputes arising out of or in connection with this contract or the interpretation thereof. If a dispute arises between the Engineer Incharge and the Consultants in connection with, or arising out of, the contract or the scope of the work, whether during the consultancy period or after completion of the consultancy period and whether before or after repudiation or termination of the contract, including any dispute as to any opinion, instruction, determination, certification or valuation of the Engineer Incharge, the matter shall be in the first place, be referred in writing to the Engineer Incharge within 30 days of its occurrence for review, with a copy to the Client. If the Consultant fails to refer the dispute for review within 30 days, the Engineer Incharge’s decision shall be final and binding on the Consultants. Such reference shall state that it is made pursuant to this Clause. No later than the fourteenth day after the day on which he received such reference, the Engineer Incharge shall give notice of his decision to the Client and the Consultants. Such decision shall state that it is made pursuant to this Clause. Notwithstanding the arising of any dispute, unless the contract has already been repudiated or terminated, the Consultants shall, in every case, continue to proceed with the work all due diligence and the Consultants and the Engineer Incharge shall give effect forthwith to every such decision unless and until the same shall have been revised, as hereinafter provided. If either the Client or the Consultants disagree with the decision of the Engineer Incharge, the decision shall then be referred by the Client or by the Consultants, within 30 days of the decision of the Engineer Incharge to the Technical Advisory Committee constituted by the Public Private Partnership Cell for the project. A copy of such reference shall also be endorsed to the Engineer. The Committee shall give its advice in writing to the Client within 30 days of receipt of notification by it. The Committee may call upon the Engineer Incharge and the Consultants to present their case before giving its advice. The Client shall then take appropriate decision on the said advice of the Committee and communicate to the Consultants within 30 days failing which the advice of the Committee shall be binding on the Client. Arbitration Clause replaced and substituted as under: The Parties shall seek to resolve in good faith any dispute or difference arising between them in respect of any matter connected with this Agreement. If the parties cannot resolve any such dispute or difference in accordance with provision in Cl. 43 the dispute shall be referred in Arbitration. Force Majeure Definition a) For the purpose of this contract “Force Majeure’ means an event which is beyond the reasonable control of a Party, and which makes a Party’s performance of its obligations hereunder impossible or so impractical as reasonably to be considered impossible in the circumstances, and includes, but is not limited to war, riots, civil disorder, earthquake, fire, explosion, storm, flood or other adverse weather conditions, strikes, lockouts or other industrial action (except where such strikes, lockouts or other industrial action are within the power of the party invoking Force Majeure to prevent) confiscation or any other action by Government agencies. b) Force Majeure shall not include (i) any event, which is caused by the negligence or intentional action of a Party or such Party’s sub Consultants or Agents or Employees, nor (ii) any event which a diligent Party could reasonably have been expected to both [A] take into account at the time of the conclusion of this Contract and [B] avoid or overcome in the carrying out of its obligations hereunder. c) Force Majeure shall not include insufficiency of funds or failure to make any payments required hereunder. No Breach of Contract The failure of a Party to fulfill any of its obligations hereunder shall not be considered to be a breach of, or default under, this contract in so far as such inability arises from an event of Force Majeure, provided that the Party affected by such an event has taken all reasonable precautions, due care and reasonable alternative measures, all with the objective of carrying out the terms and conditions of this contract. A Party affected by an event of Force Majeure shall notify the other Party of such event as soon as possible, and in any event not later than Fourteen (14) days following the occurrence of such event, providing evidence of the nature and cause of such event, and shall similarly give notice of restoration of normal conditions as soon as possible. The Parties shall take all reasonable measures to minimize the consequences of any event of Force Majeure. Extension of Time Any period within which a Party shall, pursuant to this contract, complete any action or task shall be extended for a period equal to the time during which such Party was unable to perform such action as a result of Force Majeure. Payments During this period of their inability to perform the Services as a result of any event of Force Majeure, the Consultants shall be entitled to be reimbursed for additional costs reasonably and necessarily incurred by them during such period for the purposes of the Services and in reactivating them during such period for the purposes of the Services and in reactivating the Services after the end of such period. SPECIAL CONDITIONS OF CONTRACT 1. (Note : Fill in the blanks) 50. Other Actions (i) The Consultants shall not use these documents for purposes unrelated to this contract without prior written approval of the PPP Cell . (ii) No advance payments will be made by the PPP Cell . Payments shall be made as given in the payment schedule in Terms of Reference. The Consultant shall have frequent interaction with PPP Cell at all stages for monitoring progress of work. The Consultant shall provide one well maintained A.C. vehicle (Innova or equivalent) along with driver and the same shall be kept at the disposal of PPP Cell in connection with the project during the period of consultancy. The Consultant shall bear all expenses connected with operation and maintenance of the vehicle including driver’s wages, fuel cost, repair and maintenance, etc. The expected mileage per month shall be around 1000 km/month. The Consultant shall arrange their own Office space and bear its’ expenditure, including that of operation and maintenance. In addition to the man power, Consultant has to provide one brand new HP laptop. This shall be the property of PPP Cell. With the failure in providing above desired facilities double the expenditure at the discretion of the Client shall be recovered from the Consultant. Financial Proposal (in one copy) I. Financial Proposal – Covering letter. II. Schedule of Summary Price Proposal. III. Breakup of costs for each activity/stage. IV. Agreement format for consultancy services. V. Additional information. Presentation The date, venue and time of presentation of technical proposal will be intimated separately to Consultants at least one week in advance. The presentation will be held before opening the financial proposal. INFORMATION REGARDING CONSORTIUM MEMBERS & SUBCONSULTANTS QUESTIONAIRE 1) Name of the Lead Consultant Name of Contact Person Address Telephone (O) Fax e-Mail 2) Name of member of Consortium/ Joint Venture/Companies. If any similar information as mentioned for the above 3) Name of Sub-Consultant/Associates If any similar information as mentioned for the above 4) Area of participation of all Consultants Partners and Sub-Consultants. APPRECIATION OF THE PROJECT Indicate in detail the bidder’s knowledge of the project requirement and bidder’s understanding of the requisite tasks as set forth in the Scope of Work. Indicate in detail the Method Statement covering the approach and methodology proposed for carrying out the project, including such detailed information as is deemed relevant. The bidder should indicate all tasks proposed to be carried out in detail. STRATEGY FOR IMPLEMENTAION OF THE PROJECT (Indicate in detail the strategy proposed for implementing the project, including such detailed information as is deemed relevant. COMPOSITION OF THE PROPOSED TECHNICAL & SUPPORT STAFF TEAM AND THE TASK ASSIGNED TO EACH TEAM MEMBER 1. Technical/Managerial Staff S. No. 1 2 3 4 5 2. Support Staff S. No. 1 2 3 4 5 Note: 2. “Work Plan/Time Schedule” may be attached indicating the above information. NOTES : 1) Show personnel (for all areas as mentioned in TOP) 2) Show duration by solid line for continuous Inputs and broken line for staggered Inputs considering the present commitments. FORMAT XII COMMENTS/SUGGESTIONS OF THE CONSULTANT On the Scope of Work 1. 2. 3. 4. 5. On the Data, Services and Facilities to be provided by the PPP Cell indicated in the Terms of Reference 1. 2. 3. 4. 5. FORMAT XIII DETAILS OF KEY PERSONNEL (deployed for this Project) No. FORMAT XV Financial Status (for each Member of the Group) (a) Name of the Consultant (b) Whether Individual/Proprietary/Partnership/Limited Company or Corporation/Consortium/Joint Venture (c) Annual Turnover (for the last 5 years) (Indian Rupees in lakhs) along with annual report. (d) Total Capital Employed (for the last 5 years) (Indian Rupees in lakhs) (e) Total Number of Employees (for the last 5 years) Technical Others Note: Data to be furnished by each of the members of Consortium on separate sheets. All foreign currencies should be converted to equivalent Indian Rupees. Period of five years will be a period beyond For conversion $1 = Rs. 40 rate may be presumed. FORMAT XVI EXPERIENCE APPLICANT’S EXPERIENCE OF RELEVANT PROJECTS (BOTH COMPLETED AND ON-GOING PROJECTS) Give information in the following format (For each partner of Group in separate sheet) 1. 2. 3. 4. 5. 6. 7. Project Title and Location Name of Client and Address Describe area of Participation (Specific Services rendered by the Applicant/Status of Projects in Hand) a) Period of Services rendered for the project b) Professional man-months rendered for the project Consultancy fees for the project (in Indian Rupees) Total Project Cost (in Indian Rupees) Whether the Project was handled in Joint Venture or Consortium (If Yeas, specify the JV/Consortium Partners and their role(Area of Participation) in the project) Whether any Sub-Consultant was involved, If Yes, Specify their Area of Participation in the Project. Note : 1) Supporting Documents like Certificates from the Client in support of each of the above projects to be furnished. 2) The firm will have to give declaration about no objection for reference to the Client for getting additional information about the project. A) B) C) Note: 1. The fees should be quoted in the prescribed format on next page. 2. Above costs should be quoted inclusive of all prevailing taxes and fees except the statutory service tax. Key Personnel 1. 2. Supporting Staff 1. 2. Others 1. 2. 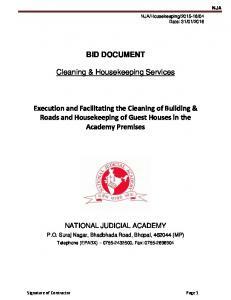 Report "BID DOCUMENT For CONSULTANCY SERVICES. For"